Exactly two years to the day since ParalympicsGB won its first medals at the London 2012, spectators returned to Queen Elizabeth Olympic Park for National Paralympic Day featuring the Mayor of London’s Liberty Festival. Visitors cheered on world-class athletes, marvelled at the sights and sounds of the Liberty Festival and took part in a variety of disability and inclusive sports. HRH The Earl of Wessex and Deputy Mayor of London Munira Mirza were among the thousands of people heading to the Park, where the stars of ParalympicsGB returned to compete once again in exhilarating international competitions in the iconic venues from London 2012. Paralympic gold medallist Jessica-Jane Applegate joined recent medal winners from the Glasgow 2014 Commonwealth Games, Steph Slater and Jack Thomas, in a nail-biting international swimming competition – the first to take place in the London Aquatics Centre since London 2012. In the Copper Box Arena Great Britain’s women’s wheelchair basketball team sought to make up for an earlier loss as they took on the Netherlands. Two years ago to the day the teams came face to face in the opening match of London 2012 with the Netherlands coming out victorious. Also in action in the Copper Box Arena were the stars of boccia and goalball. London 2012 boccia gold medallists Greece, who are also the current world champions, avenged their narrow defeat to the British team at last year’s National Paralympic Day and Great Britain’s women’s goalball team took on Belgium in the same venue where they saw success at London 2012. Away from the venues there were plenty of free, family friendly activities and entertainment taking place across the Park. Visitors got involved by trying out different disability and inclusive sports such as wheelchair basketball, inclusive cycling, tennis and boccia. Representatives from disability sports project Motivate East were also on hand to provide advice about opportunities to take up sports or get involved in the local area. In the shadows of the venues where many of them became household names, stars of ParalympicsGB met fans and signed autographs. Paralympic gold medal winning sprinter Jonnie Peacock was joined by discus gold and shot put bronze medallist Aled Davies, long-jump silver medallist Stef Reid and cyclist Jody Cundy as well as one of Great Britain’s first ever winter gold medallists Kelly Gallagher and Charlotte Evans and the most successful ever British winter Paralympians Jade Etherington and Caroline Powell. Also in the Park, the Mayor of London’s Liberty Festival, the hugely popular annual showcase of Deaf and disabled artists, was once again bringing an exciting line-up of street theatre, dance, live music, film, installations and children’s activities. Highlights included integrated dance company Moxie Brawl, who evoked the spirit of the 1940s; Deaf Men Dancing, whose duet ‘TEN’, takes its inspiration from artists Gilbert and George; singer Ren Harvieu, acclaimed for her top five album ‘Through the Night’; ‘The Gift’, an immersive sound installation from Jez Colborne and Mind the Gap; Paul Evans and Amelia Cavallo are presenting a new collaboration, combining the talents of an aerial and vocal specialist and a visually impaired aerial singer; and Stop Gap are presenting ‘The Awakening’, choreographed by Chris Pavia. “I am so pleased to see such a fantastic response to National Paralympic Day 2014 across the country, including here in London. At Queen Elizabeth Olympic Park, GB athletes have returned to some of those iconic venues from London 2012 and competed fantastically well in front of cheering crowds. And we were honoured to welcome our Royal Patron, The Earl of Wessex, who with his family joined Paralympic heroes such as Jonnie Peacock, Aled Davies and Kelly Gallagher in helping us mark the day. National Paralympic Day featuring Mayor of London’s Liberty Festival is brought to you by the Mayor of London, the London Legacy Development Corporation and the British Paralympic Association. For more information visit QueenElizabethOlympicPark.co.uk. 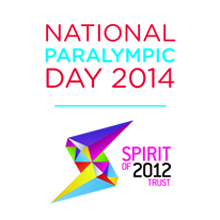 Be the first to comment on "National Paralympic Day 2014 featuring Mayor of London’s Liberty Festival"